For a presentation at the Neo4j User Meeting in Tokyo I have converted the TeX Live Database into a Graph Database and represented dependencies between all kind of packages as well as files and their respective packages as nodes and relations. Update 20181010: I have worked out the first step mentioned in further work and got rid of uuids completely and use package names/revisions and file names as identifier. I also added a new node type for TLPDB and renamed the relation between packages and files from contains to includes. The former now refers to the relation between TLPDB and packages. The text and code has been updated to reflect this. Basic macro packages These are the meat of TeX Live, the actual stuff our upstream authors are writing. Typically LaTeX or font packages, they are either of category Package or ConTeXt. Packages for binaries These are packages that ship “binary” files – which means files that are installed into the bin directory and are executable. Some of these are actually scripts and not binaries, though. Collections A Collection contains basic and binary packages, and might depend on other collections. We guarantee that the set of collections is a partition of the available files, which allows distributors like Debian etc to make sure that no file is included two times in different packages. Schemata These are the top-level groups that are presented to the user during installation. They depend on collections and other packages, and try to provide a meaningful selection. In total, we are currently at the following values: 9 Schemata, 41 Collections, 6718 Packages (Package, TLCore, ConTeXt), and about 181839 files. 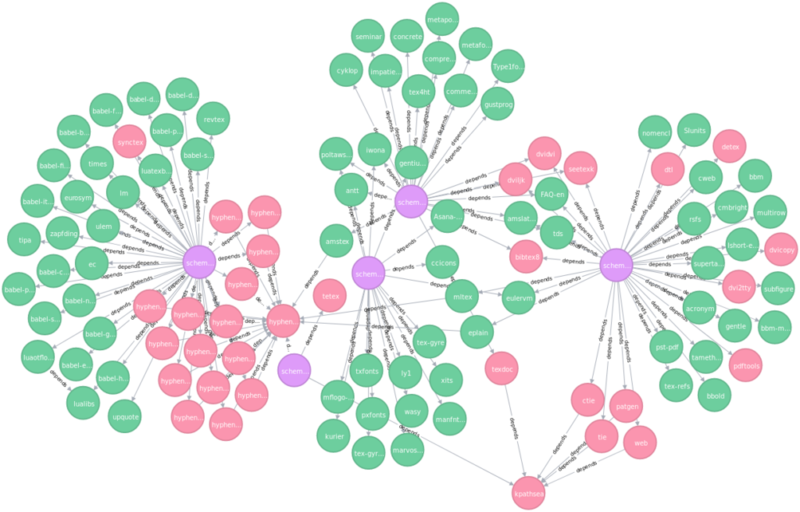 Representation as graph was relatively straight-forward: We decided for separate nodes for each package and each file, and relations of dependency (depend in the above examples), inclusion (files being included in a package), and containment (a package is contained in a certain tlpdb revision). For the files contained in the database I use the file name as identifier, thus the respective csv only contains one field, the file name (enclosed in quotes to make sure that spaces are not mistreated). There is a node type TLPDB with only identifier revision that carries the current version of the tlpdb used. IMPORT DONE in 2s 93ms. Here we use LABELS to find all the labels of a node. Here we use the * operator to search for arbitrary long paths. Interestingly we got one result, namely that ConTeXt depends on itself, something that is not good anyway. After a restart of Neo4j one is ready to use all the algorithms provided in this jar. [DONE 20181010 – see above] During the presentation we got the suggestion to use hash values of the node content instead of arbitrarily computed uuids to allow for better upgrades/additions in case the values of nodes did remain the same. Furthermore, it would be interesting to parse the full information of packages (including revision numbers, catalogue information etc), save them into the nodes, and regularly update the database to see the development of packages. To make this actually work out we need the first step of using hashes, though. Considering that all of the above plus the actual presentation slides were written in less than one day, one can see that developing a graph database based on Neo4j and playing around with it is a rather trivial procedure. The difficult part is normally to find the “right” set of node types and relation types, as well as their attributes. 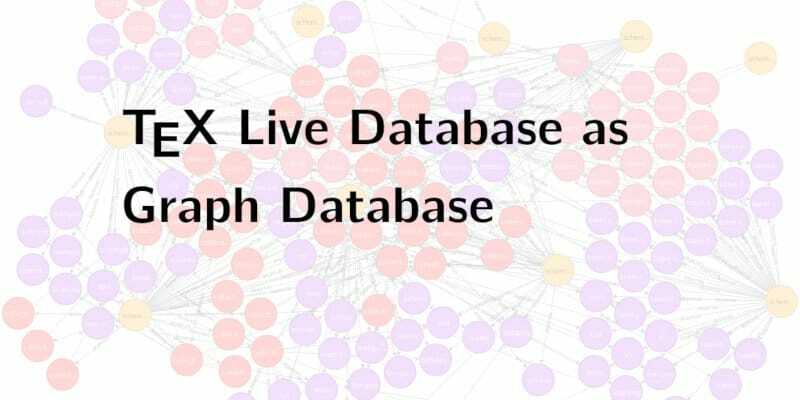 In the case of the TeX Live database this was quite trivial, which allowed for an easy and direct representation in Neo4j. 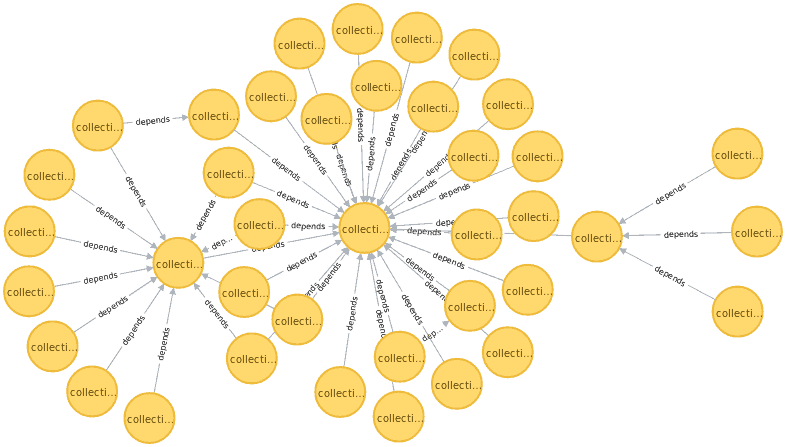 We made the graph (read-only) available for experimentation at http://texlive.info:7474/browser/ (with user/pass neo4j). We hope that these simple examples of graphs help others to kick-start more interesting and deeper projects using the power of graphs. Forgot to say, I designed the tlpdb format with this background, that is why I said “based”, or “inspired”. Indeed, getting only the basic/binary packages from a scheme or collection is not trivial and would need either several invocations of tlmgr, or a minimal perl program using the modules. 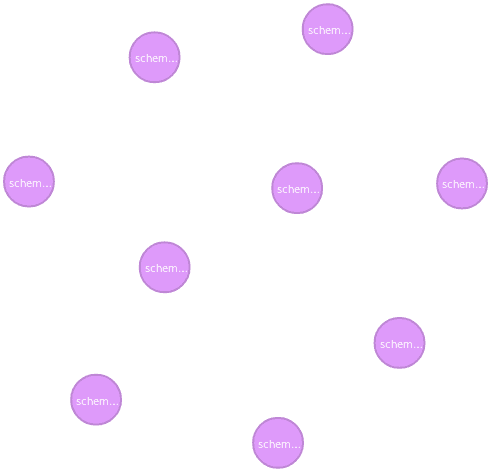 Or you just get the dependencies and make greps etc, collections are always called collection-* and schemata scheme-*. Concerning the web demo – I guess it mostly depends on how much it is used and how much it hits on my server’s CPU/mem 😉 The URL is not strange, texlive.info is used also for tlcontrib, and the port is the standard port for the Neo4j browser. Why is it “not good” ? it doesn’t hurt, but is strange. In fact it is an artifact because in our tlpsrc there is no such dependency, but it is automatically added in one of our generation scripts.